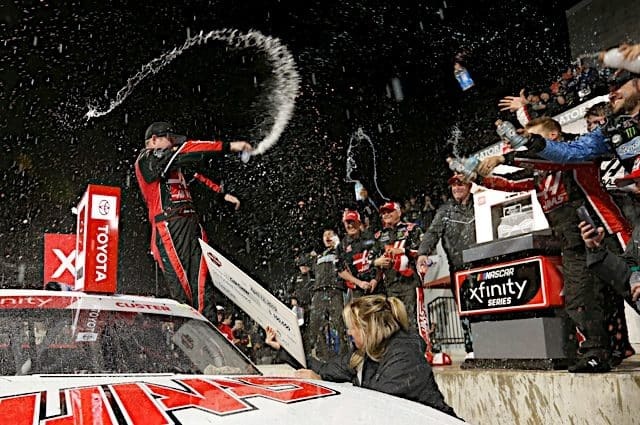 Last spring’s O’Reilly 300 featured a first-time XFINITY Series winner in Chase Elliott, who set a record as the youngest driver to take the checkered flag first. 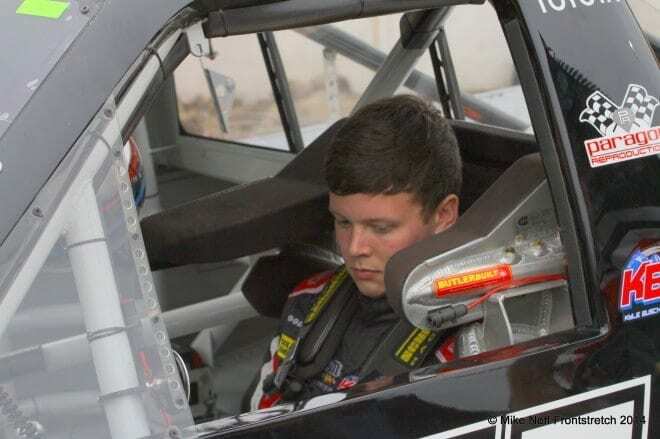 This year, it was Erik Jones who scored his first career win and became the second youngest winner in the XFINITY Series at 18 years, 10 months and 11 days. Jones dominated all three rounds of qualifying and scored his first career pole before leading a race-high 79 laps. 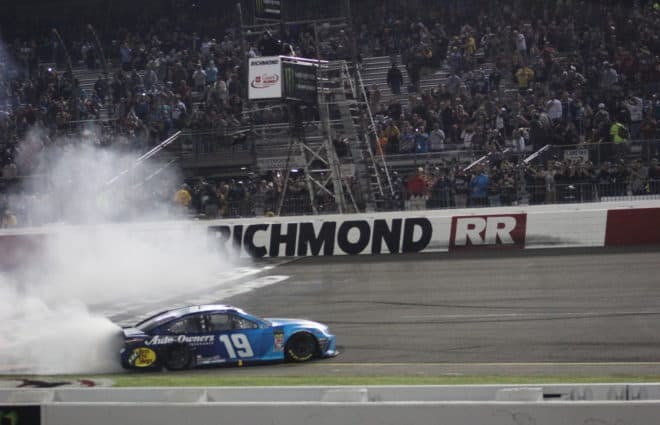 The Joe Gibbs Racing up-and-comer, who never dropped outside of the top 10 throughout the night, surged in front on the final restart and helped deliver crew chief Chris Wheeler his first career victory as well. Chris Buescher didn’t even make it through the first lap before he scrubbed the outside wall hard enough to leave fluid on the track and slow the race. The driver of the No. 60 Ford was forced to head down pit road and restarted deep in the field, his chances for a strong finish seemingly over. But pit road strategy saw crew chief Scott Graves keep Buescher out when most of the leaders stopped, taking advantage of a midrace caution to propel him back toward the front of the field. While he was unable to remain inside the top 5, never a threat for the win Buescher salvaged a solid ninth-place finish and greatly diminished the hit that a poor result would have made on his bid for the championship. 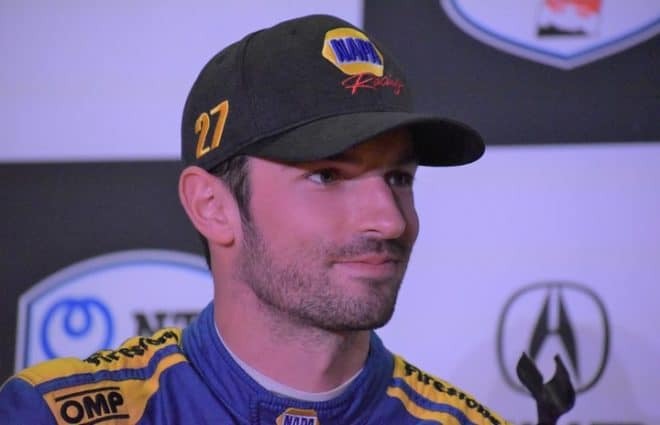 Brandon Gdovic made his XFINITY Series debut with Viva Motorsports Friday night, making only his third stock car start on a mile-and-a-half track (the other two came at Kansas and Kentucky in an ARCA machine). 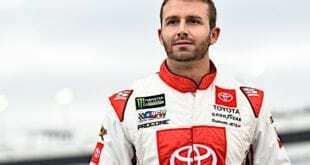 He didn’t make it past the first round of qualifying and started 29th, leaving him deep in the field in a race where passing was at a premium. But the important part of Gdovic’s debut was that he managed to keep his nose clean and give clear, calm feedback to crew chief Mike Setzer. 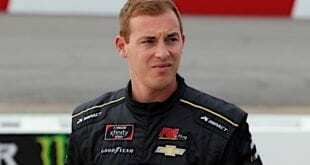 At this point in his career, Gdovic is focused on gaining experience and making a few more XFINITY starts, a future he earned handily without getting into trouble on the track. Gdovic finished 26th, four laps off the pace and gave hope he’ll build toward better results in the future. 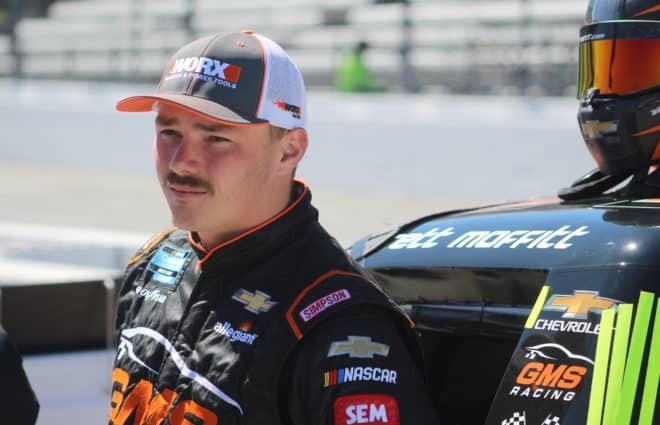 Before the green flag flew, Brendan Gaughan expressed his excitement and optimism for the O’Reilly 300 at a track where he has won four times in the Camping World Truck Series. But a cut tire forced him to make an unscheduled pit stop that dropped the driver of the No. 62 Chevrolet to 32nd, two laps down. … Cale Conley cut a tire on lap 169 and shot straight up the track into Gaughan’s No. 62 Chevrolet, severely damaging both drivers’ cars. Gaughan was forced to climb part of the catchfence after his car came to rest up against the inside wall in turn 2. While Conley’s crew furiously worked on the damage to the No. 14 Toyota in the garage area, the incident proved to be terminal, and he was left to settle for a 34th-place finish. 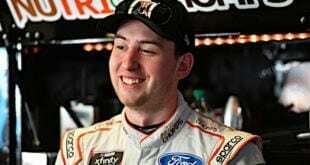 Brennan Poole once again impressed in just his third XFINITY Series start. The driver of the No. 42 Chevrolet qualified tenth but dropped backward after the green flag flew, nearly falling outside the top 20 during the first half of the race. But Poole and crew chief Mike Shiplett worked on the setup, boosted speed on the car and spent most of the second half inside the top 10 before winding up a credible 13th. While Poole is far from burning up the track and challenging for wins, he has yet to record a DNF and continues to gain valuable experience with each lap he turns. Friday night’s O’Reilly 300 was your typical aero race where the leader got clean air and was able to leave the rest of the competition behind. 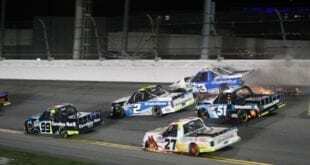 Five of the top 7 finishers did not score any points, having declared for a different series, leaving Regan Smith (fourth) and Darrell Wallace, Jr. (sixth) as the only two XFINITY regulars in that group. While Dale Earnhardt, Jr. and Brad Keselowski made it look like they might have something to compete with Erik Jones, Jones was truly the class of the field all day and stole the show. For much of the race, the field spread out, tightened up only by the six cautions that flew. Sometimes, you have a dominant driver like that but Texas reminded NASCAR they still have work to do with handling on 1.5-mile ovals. Ty Dillon remains the championship leader by a slim two-point margin over Chris Buescher, who rallied after early problems. Not far behind, Chase Elliott sits 11 markers behind the leader, followed by rookie Darrell Wallace, Jr. Ryan Reed and Regan Smith are tied for fifth, ahead of Elliott Sadler. Brendan Gaughan’s DNF dropped him two positions to eighth, now 43 points behind Dillon. Brian Scott and rookie Daniel Suarez rounded out the top 10. 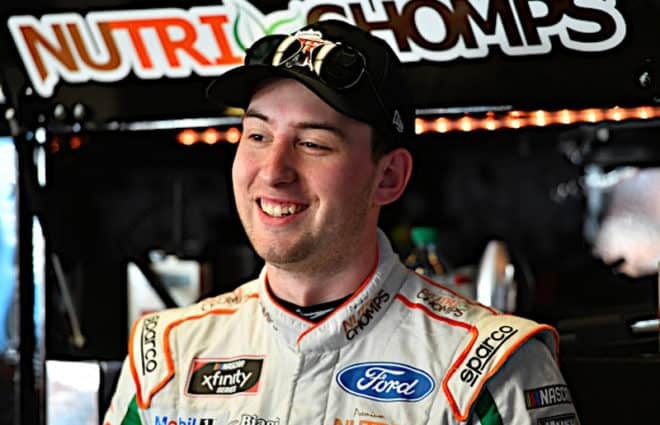 “Good sixth-place finish, I think it’s the best for me with Roush Fenway. Exciting night for us. I could not go on the bottom; I hated the bottom. Every time I got on the bottom I wasted like eight years down there. It never helps when you’re trapped on the bottom. But we’re showing progression each and every week. Our time will come soon. I’m excited for Bristol, Richmond—those are good tracks for me.” – Darrell Wallace, Jr.
…and a big congrats to the winner…good to see. Except, no one actually saw it as few bothered to watch. A series driver screwed up Cup practice, yawn. Chase Elliot IS NOT the youngest driver to win in this series(regardless of the sponsor name). The youngest is Joey Logano, 18 years 21 days. Next is Chase Elliot 18 years 4 months 6 days…followed by Eric Jones 18 years 10 months and 11 days. In the rush to make stories and pump someone up, this erroneous information has found it’s way into more than one article. Lazy and incorrect. Who fact checks?